Is it really possible to love one's enemies? That's the question that sparked a fascinating and, at times, terrifying journey into the heart of the Middle East during the summer of 2008. It was a trip that began in Egypt, passed beneath the steel-and-glass high-rises of Saudi Arabia, then wound through the bullet-pocked alleyways of Beirut and dusty streets of Damascus, before ending at the cradle of the world's three major religions: Jerusalem. 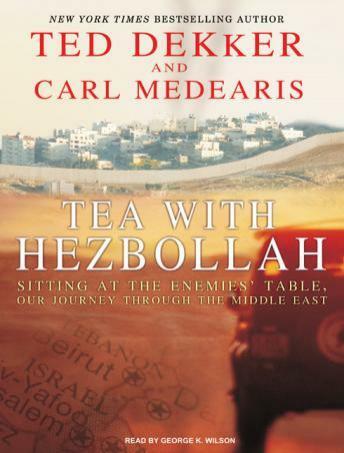 Tea with Hezbollah combines nail-biting narrative with the texture of rich historical background, as listeners join novelist Ted Dekker and his coauthor, Middle East expert Carl Medearis, on a hair-raising journey. They are with them in every rocky cab ride, late-night border crossing, and back-room conversation as they sit down one-on-one with some of the most notorious leaders of the Arab world. These candid discussions with leaders of Hezbollah and Hamas; with muftis, sheikhs, and ayatollahs; and with Osama bin Laden's brothers reveal these men to be real people with emotions, fears, and hopes of their own. Along the way, Dekker and Medearis discover surprising answers and even more surprising questions that they could not have anticipated-questions that lead straight to the heart of Middle Eastern conflict.